After years of waiting, the Farnham-Connolly State Park (AKA the Canton Airport) is finally open, offering access to a lovely six acre passive use park off Neponset Street in Canton, and 232 acres of beautiful freshwater marshes and wetland habitats along the Neponset River. 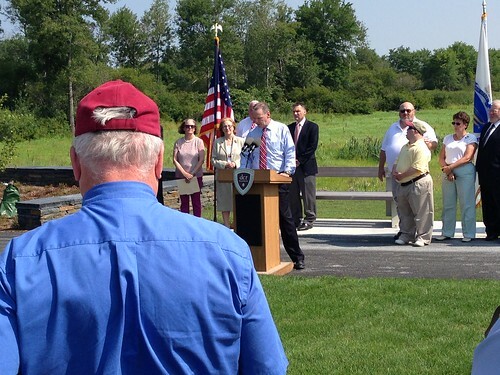 It was a beautiful day to dedicate a brand new state park on the banks of the Neponset River. About 50 people gathered at the Canton Airport on Neponset Street for a ribbon cutting complete with five-foot long scissors to open a beautiful new park, now officially known as the Farnham-Connolly State Park, in honor of two local World War II pilots. 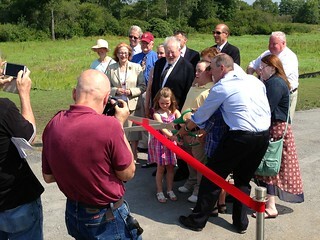 The ribbon cutting got its start during a summer 21 years ago when Andrew Gregg, then a summer intern with the Neponset Watershed Association, and Ian Cooke, who was soon to become the Association’s Executive Director, were trying to plot a new route for the Warner Trail through the Fowl Meadow marshes. Andrew had spotted a potential route through a series of privately owned parcels that stretched from just south of the East Branch of the Neponset and along a sewer berm up to Signal Hill, and then continuing north along the river up into the Blue Hills. It was a perfect route, and along it, Andrew had found some of the most beautiful freshwater marshes in the Neponset Valley. They invited Jim Comeau, who then worked in land acquisition for the Metropolitan District Commission, to take a walk. 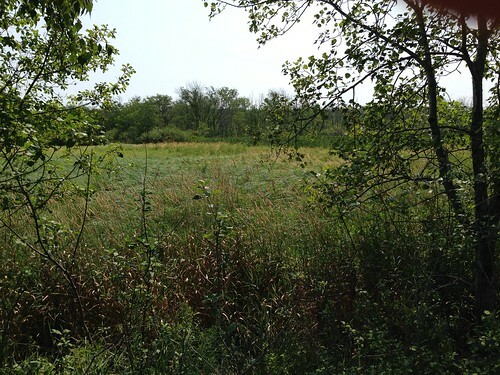 Jim described what he saw as a perfect fit for the MDC: large areas of unprotected, high value wildlife habitat (now in the heart of the Fowl Meadow Area of Critical Environmental Concern) with tremendous public recreation potential. Over the next 15+ years, the Commonwealth slowly but surely worked to acquire and incredible 718 acres of land along this corridor, the parcels south of the East Branch, the Canton Airport itself, Signal Hill, and floodplain land along the river that connects to the Blue Hills. This sustained effort had lots of enthusiastic helpers along the way from Representative Bill Galvin and Senator Brian Joyce, to Governor Deval Patrick, the Canton Board of Selectmen, the Trustees of Reservations, a conservation-minded landowner, and many others. One of the biggest pieces of this puzzle though was the Canton Airport itself. In spite of having done pre-acquisition soil testing, it became apparent that the Canton Airport had serious contamination issues after it was acquired, and so the site was fenced off, and had remained closed to the public until just a few weeks ago. Years of hazardous waste cleanup work led by Chief Engineer Michael Misslin and his team at the state Department of Conservation and Recreation (successor to the Metropolitan District Commission) along with lots of help again from our state and local political leaders, have finally made it possible to open the park to the public at last. Today, the Farnham-Connolly State Park (AKA the Canton Airport) features a small parking area, a six-acre passive-use park with sun shelters, interpretive signage, paved paths, wetland overlooks and a formal memorial site, plus 232 acres of beautiful freshwater marshes and other wetland habitats. 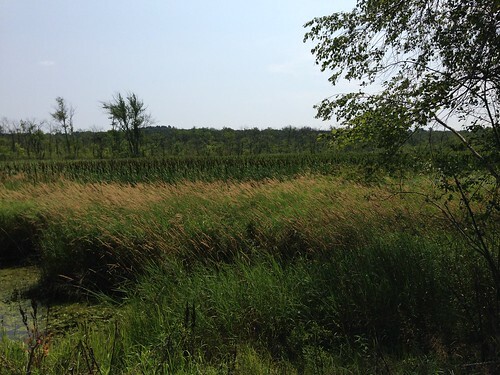 The marshes are primarily accessible along an unpaved trail that runs north to south along the sewer berm originally identified by Andrew Gregg. The trail runs through the site for about a mile and dead ends at route 95, but the Mass Department of Transportation has pledged to create a new pedestrian and wildlife underpass that will eventually connect to properties along the river to the north. 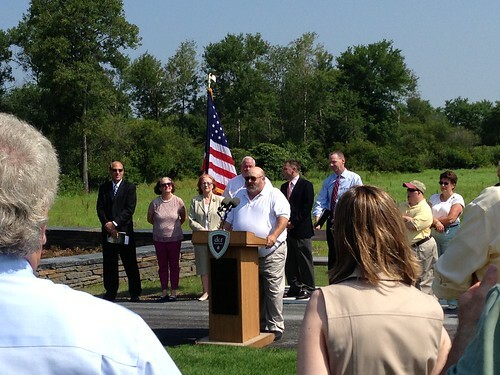 A copy of the state’s press release on the ribbon cutting can be found below the photograph. 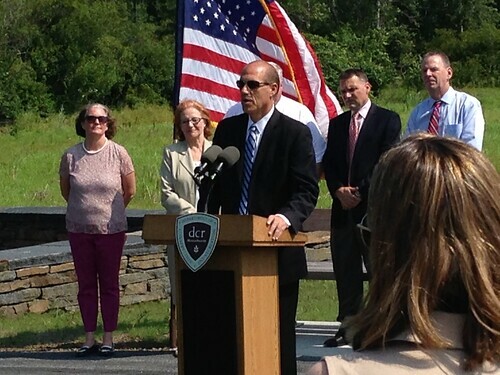 CANTON — Wednesday July 23, 2014 —Energy and Environmental Affairs (EEA) Secretary Maeve Vallely Bartlett joined Department of Conservation and Recreation (DCR) Commissioner Jack Murray, Senator Brian A. Joyce and local officials to formally dedicate DCR’s Lt. Arthur E. Farnham and Sgt. Thomas M. Connolly Memorial Park in Canton. The six-acre park project highlights the Patrick Administration’s commitment to improving and expanding parks in urban and densely populated areas. 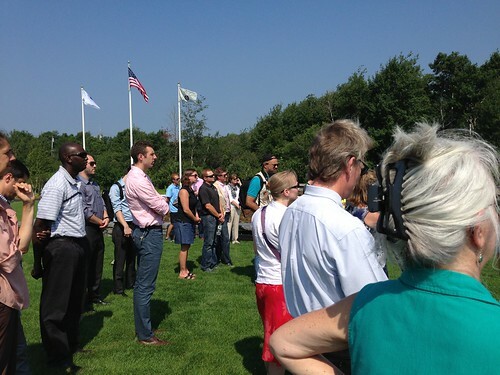 The park was dedicated to two World War II veterans who had worked at the site. Sergeant Connolly and Lt. Farnham were on the same B24 bomber crew and rescued in the Halyard Mission, a once top-secret mission that involved the rescue of more than 500 American airmen. The mission is viewed by historians as one of the greatest rescue missions of World War II. In August of 2011, Canton resident Paul Seery, a former co-worker of Connolly’s at Emerson and Cuming, and Connolly’s son, Ted, asked the Board of Selectmen to consider naming the park in honor of the two men, who had worked as mechanics. “All I can say is that is I appreciate this extremely wonderful park more than I can fully express” said Bob Connolly, son of the late Sgt. Thomas M. Connolly. Originally opened in June of 1931 as the state’s third largest airport, Canton Airport served as a popular local flight school throughout the 1930s and 1940s. The first Helioplane was designed and flown at the airport in 1949. Due to flooding and a failure to modernize, the Canton Airport closed in the late 1950’s. 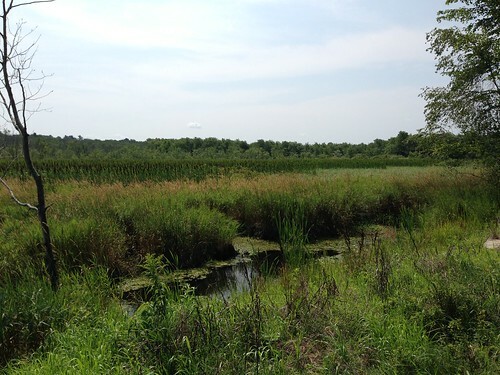 The Commonwealth purchased the site in 1996 to be part of a larger, 238 acre site within the Fowl Meadow/Ponkapoag Area of Critical Environmental Concern (ACEC). The $7.8 million remediation and cleanup project began in 2000 after significant contamination was discovered at the site, stemming from industrial use after the Canton Airport closed. “These men truly deserve this honor. The heroism they displayed during WWII, when they were really just kids in their early 20s, is remarkable. They are credited with saving fellow servicemen after being shot down over Yugoslavia and surviving for 42 days until they were rescued. The fact that they met and trained at this airfield makes this naming extra special,” said Representative Galvin. 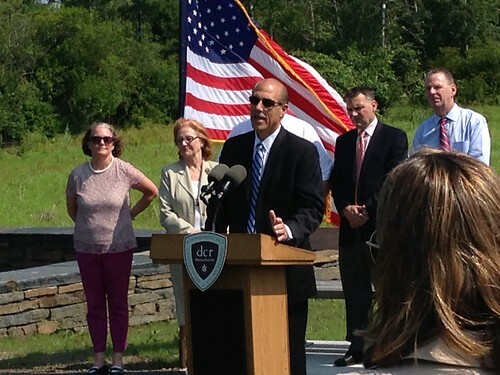 How wonderful for Canton and the surrounding towns who have access to it. Congratulations, and thank you!